CES isn’t just about innovation for humans. Sometimes your pets benefit from the technology on display as well. Petwalk is showing off the world’s first fully connected pet door at CES 2018. 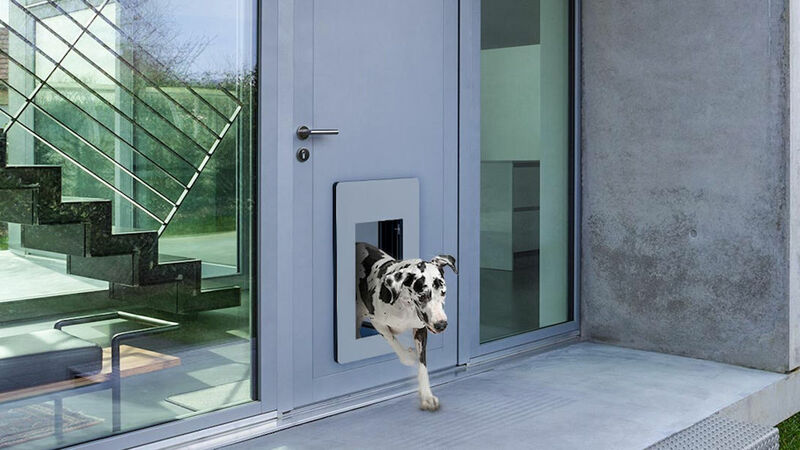 This pet door can be controlled via remote, mobile devices and web browsers, or through the ID chip on your pet. With one tap, you can open or close the door. It can also open via a transponder implanted under your pet’s skin. It’s a pet door for the modern age. Maybe it’s raining outside and you want Fido to stay in. You can keep the door closed. The door looks a lot like a vault and it is insulated door and airtight. This keeps your home secure from burglars and also keeps noise and bad weather out. The door connects to your alarm system to keep things extra secure. The design looks good in the home and this door can be installed on any wall, glass or door and closes softly so that your pets don’t get hurt by it. The user can use any cloud based media service to make a face recognition for your pets. The data gets sent to Petwalk and if they determine that it is not your dog, that dog is staying outside. If they are unsure if this is your pet, they send you the video stream so you can decide to let the dog in or not. Could Petwalk be an Amazon Key Alternative? During the conversation, we pondered if this pet door could come in handy for Amazon deliveries. The delivery service scans the QR code to send a message to your device, you confirm the delivery, and allow the door to open. A camera can even be positioned inside to ensure the package is the only thing coming in. Petwalk will be available in the US shortly (Currently in 30 countries worldwide). They will be available in the 2nd half of 2018 starting at around $1900. Check out more at Petwalk.